There is currently trouble brewing in China as several foreign internet companies are experiencing accessibility issues in the country for their services — including messaging apps Line and Kakao Talk, as well as Yahoo-owned photo sharing site Flickr and Microsoft’s storage service OneDrive. Tech in Asia first spotted that there were problems with Line in China. A Line spokesperson told TNW its service in Mainland China (provided in conjunction with a local operator under the name of Lianwo) is still experiencing a connection issue that began on the night of July 1. “We are currently investigating the issue and trying our best to resolve the situation,” the spokesperson said. Subsequently, the Wall Street Journal noted that Kakao Talk was also having problems. A Kakao spokesperson told TNW that all pre-registered users can still chat via text, make free calls and share images with current friends on the app, but certain features such as adding new friends, the use of certain emoticons and checking notices aren’t accessible at this time, and users are also having trouble logging onto their desktop versions. The spokesperson added that issues with the app are still continuing but the company isn’t 100 percent sure what is causing them. In the meantime, censorship monitoring organization GreatFire notes that Flickr and Microsoft’s OneDrive are inaccessible in China too. A Microsoft spokesperson told TNW that it is “investigating reports that customers of OneDrive are experiencing access issues in China,” but has nothing more to share at this time. GreatFire’s Charlie Smith said that the reason for these issues is most likely due to the Chinese government clamping down on photo sharing of the Hong Kong demonstrations, which took place earlier this week to demand universal suffrage. This wave of foreign sites being blocked or having issues comes after Dropbox was once again blocked in China last month, following the Chinese government’s most severe crackdown on Google’s services to date. Gmail, Google Maps, and other Google services have been entirely blocked in China since early June, in conjunction with the 25th anniversary of the Tiananmen Square protest on June 4. Till now, many of them remain inaccessible. Line set up local operations with a local partner and then abided by the daily censorship directives. But in the end, their service still gets attacked by the authorities. So the question clearly now is why work with the authorities in the first place? Foreign internet companies who have not yet made their mark on China should be paying close attention to what is happening now. There are ways to offer your service inside China without having to self-censor or play the censorship game and without getting your website or mobile app blocked. 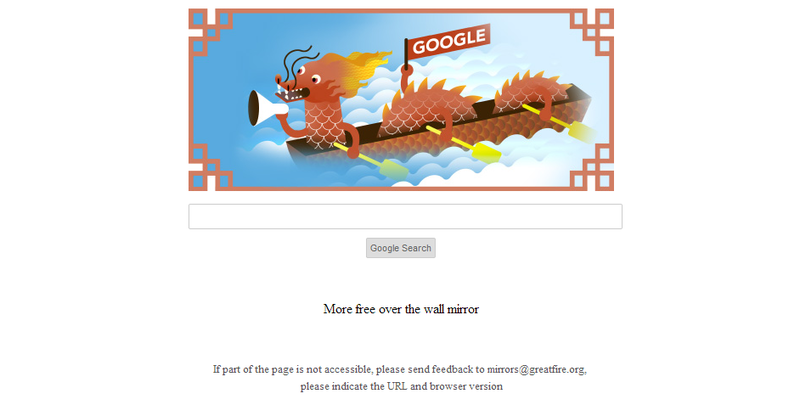 GreatFire has tried to beat the censors by turning to hosting services that encrypt their content and can be used to host mirrors. In the case of Google, it offers a version of the search engine that is hosted on Amazon servers — which is currently still unblocked. Smith revealed that over one million users in China have used this “FreeGoogle” service, though he acknowledged that it is becoming increasingly likely that the authorities could shut it down by cutting access to cloud service companies. It isn’t clear why China is targeting these certain internet services instead of others such as WhatsApp or Instagram, which can also be used to share photos. However, the fact that so many of these companies are baffled by the latest development — and trying hard to solve the issues for their users — creates a lot of inconvenience, and highlights the difficulty of operating in China with the government’s harsh (and unpredictable) censorship actions.